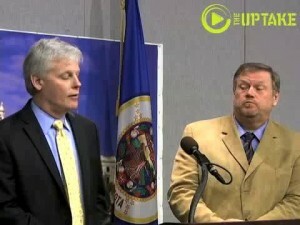 Click photo to hear why DFLers Paul Thissen and Tom Bakk are upset about Republican inaction. Minnesota House Speaker Kurt Zellers says any state foreclosure moratorium should wait for federal legislation and lawsuits to play out. DFL leaders say foreclosures are about to increase and state action is needed. The Vikings stadium is dead, long live the Vikings stadium. One plan dies and another plan is given a green light for a vote at the Minnesota legislature. The federal government and 49 state attorneys general have reached a landmark $25 billion agreement with the nation’s five largest mortgage servicers to address mortgage loan servicing and foreclosure abuses.